Wow! Today is the last day of November. Thanksgiving is done and December is upon us. Both Thanksgiving and Christmas remind me each year just how much I have to be thankful for. Right now I am taking some time off work to take care of my husband who is in the midst of recovering from a major surgery and I haven't had much time for my blogging, but I am extremely thankful for the opportunity to be here with him, for the progress he is making, and for the wonderful people I work with who are keeping an eye on my precious kiddos. I am also thankful to have a few minutes to write this post and to share a freebie with you all. You can grab it at the end of the post, but here is a preview. When I sat down to write this post I read in my comments that Sally at Elementary Matters awarded me the Sunshine Award! Thanks Sally for giving me one more thing to be grateful for. Like most awards this one comes with some requirements. One is to thank the person who gave it to you and write about it. Another is to answer these questions. The last is to pass it on to 10-12 blogs, link to their blogs, and let them know. Here are the questions and my answers. 3. Favorite number? hmm...I am going to go with 7 because it is supposed to be lucky. 7. Giving or getting presents? I like them both. I know I am supposed to pass the blog on to 10-12 blogs, but honestly I don't have time for that many right now. So, I am going to pass this on to just 3. Stop by and check them out. They make for some fantastic reading. 1. Ms. Preppy: Adventures in Primary and Polkadots! Okay, so now that November is wrapped up and December is about to start I am getting in the holiday spirit. I made a game that I called "Cover Up." It is a partner game. You will need 11 two sided chips or 11 of two different kinds of chips. The players take turns rolling the dice and adding them up. The player covers up the sum with his or her chip and records the problem on the recording sheet (if you want). When all sums are covered up the player with the most chips on the board wins. These are the board game, dice template, and recording sheet. I hope your students enjoy it. Just click on one of the pictures to grab your copy. I can't beleive my last post was before Halloween. Life has been crazy! I had to take a break in my blogging to take care of my husband who was having some serious health problems. I am grateful that his recovery is going well enough that he could spend Thanksgiving with our family. I hope that you are all enjoying a wonderful Thanksgiving as well. 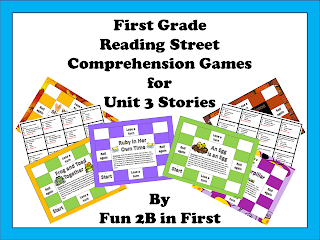 I recently finished and posted my First Grade Reading Comprehension Games for Reading Street Unit 3 on both TPT and Teacher's Notebook. Also, I will be participating in the Cyber Monday sale on TPT and Teacher's Notebook on Monday only. All of my products will be on sale for 30% off at both sites. Stop by if you are interested. Click here to go to my TPT store or here to go to my Teacher's Notebook store.